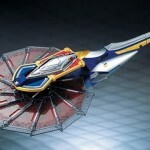 Soul of Chogokin Daizyujin/Dino Megazord Revealed at Power Morphicon! Now this is probably the biggest surprise of all from this years’ Power Morphicon. Earlier today Tamashii Nations teased that they would indeed have something to show off at PMC this weekend. The reveal of that item comes as a total surprise to many, but lo and behold they have just revealed Soul of Chogokin Daizyujin! AKA the original Mighty Morphin Dino Megaord! The individual mecha/zords are on display currently with no combined mode shown yet, but wow what a reveal this is! A truly surprising and interesting development from this years show. We’ll keep you updated as more and better pictures and information become available for Soul of Chogokin Daizyujin/Dino Megazord! 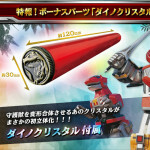 Super Sentai Artisan Dino Buckler Images Updated, Dino Crystal Revealed! The recently revealed Super Sentai Artisan Dino Buckler has just had it’s order page updated by Premium Bandai! Now listed in official images is the previously mentioned Tyrannosaurs Dino Crystal! It’s a small update to an already impressive package, but a welcome one. As a nice bonus item that has never seen release in the US, the Dino Crystal helps set apart the Dino Buckler from the Bandai America Legacy Morpher just a little bit more. The Premium Bandai exclusive Super Sentai Artisan Dino Buckler will be released in march 2016 for 4860 yen!